Anya Grant: My name is Anya Grant and I'm the Creative Empowering Officer and Marketer of iHEARTmyhair.com. NC: Tell us about your natural hair journey. Have you always worn it natural, or when and why did you decide to start wearing it natural? AG: I was Natural from the day I came out of the womb until grade 7 (twelve years old). It all started once I hit grade 6. I wanted to perm my hair so badly, especially since everyone was doing it. I was raised by my grandmother who was not having that, not one bit! So for my elementary school graduation there was no straightened hair do. It was like a regular school day with big plaits and hair ribbons and a few tiny plaits in front for a bang. I stopped perming my hair in 2003 during my first year of University. I have done EVERYTHING POSSIBLE to my hair: I dyed my hair 3 times, texturized it twice, damaged it with heat from flat ironing and put Hydrogen Peroxide in to lighten it. I've done every hairstyle you can think of — straw sets, corn rows, braids, twist outs, wigs, weaves, water curls, etc. It wasn't until the end of 2008, after much distress, that I got fed up and turned to the internet, read books and articles and educated myself about natural hair. On December 19, 2008 I did, what I considered to be my last BIG CHOP. It was more than just cutting off stringy damaged hair it was liberating and uplifting. I began my natural hair journey again this time with a healthy, well informed start. NC: Were you a long-term or short-term transitioner? Any big chops? AG: I call myself the queen of big chops in a span of 7 years I big chopped my hair 5 times. Every time I damaged my hair I would start all over again. If you are thinking of going natural, I recommend that you do a BIG CHOP. The feeling that you get after is just out of this world. Everything around me started to fall into place. More importantly I was forced to love and accept myself just as I am. I HEART my hair. NC: How did your friends and family react to the decision to go natural? AG: My dad loved it. Most of my family is natural, and as I transitioned into being natural, I was also transitioning with my friends. I was too busy having a love and hate relationship with my hair plus counseling other women to do the same to even care about who liked or didn't like my natural hair. AG: Currently I'm a low maintenance gal. I keep my hair in protective styles so that I can retain length. I wash and condition my hair every two to three weeks, at that time I also do a deep treatment to keep my tresses soft and smiling. NC: What are your favorite products? AG: Oh my goodness, I'm still trying to figure this out! I'm really in love with Koils by Nature Hair and Body Butter and Koils by Nature Eucalyptus Gel. These products combined give my hair the perfect twist out. From Shea Moisture's black soap line, the shampoo cleanses my hair so gently.For really defined twist outs and amazing curl definition I like Jane Carter Solution Curl Defining Cream. 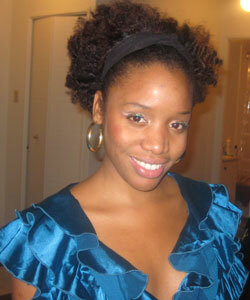 NC: What are your favorite go-to natural hairstyles? AG: I very rarely wear my hair out so my go to style for work, dance and normal daily activities would be my hair protective styles with twist. NC: What are your must-have products and tools for yourself or your clients? AG: I must have: a creamy conditioner, a wide-tooth comb, a detangling brush and a moisturizer filled with yummy natural oils. NC: What about your hair stylists, since you are one? Do you think you are your own best stylist, or do you ever have anyone else do your hair? AG: I do believe that I understand my hair the best! However, no one can see the top of their head, so I do see a hair stylist for other services such as flat ironing and trimming. NC: Who are your personal natural hair idols? AG: Alicia James (aka hair crush from YouTube) and My grandma — she always kept her thin, easy to comb hair in a short signature cut. NC: Do you have any tips or tricks for women with natural hair as far as styling, fighting frizz, retaining length, etc? AG: I have so many, but I guess I'll start by mentioning styling tips since this is always the issue of concern that comes up for many women. When it comes to styling your hair, always look for what looks good on YOU. As for me, I look better with the back of my hair up, so twist outs or any afro styles do not look that great on me. Once you know what looks good on you, just be creative and don't be afraid to experiment. Try to create one different style a week just by looking in the mirror and make your hands do the rest. You never know what you may create. NC: Why did you start your blog/business, iHEARTmyhair.com? AG: I started I Heart My Hair during a series of events. First, I transitioned from chemical to natural 5 times and was growing sick of constantly cutting my hair. 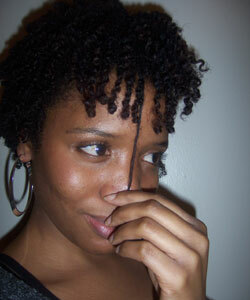 Second, I was living in Brazil with a TWA and everyone kept telling me I should straighten it. Then I dabbled one last time into a mild mild mild perm which made my hair two tones. I got fed up again with the pressures of society and chopped it off one last time in 2008. Since then I started to document my journey to hold myself accountable for myself and for others. The 3rd event that took place was being extremely emotional after watching Tyra Banks show on good hair. After listening to how those girls felt about themselves I knew I had to make a change for the girls in my immediate community and internationally. AG: I Heart My Hair is unique because we connect self esteem with hair and create fun, interactive workshops for young girls and their guardians in a series of workshops called “I Heart Me”. 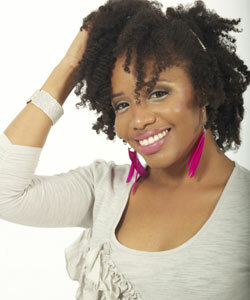 We also offer concrete and reliable referrals for fans to visit a natural hair salon in their area. NC: Why is it important to you to help your clients understand their hair "personality"? AG: When encouraging a client to embrace their natural hair, I always refer back to the reasons why they originally wanted to go natural. 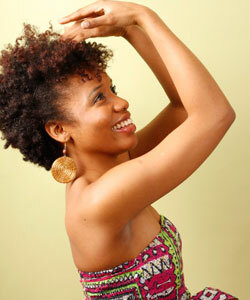 Going natural is not a trend, its a way of self discovery and a way of being. Very often people get caught up in the day to day hair struggles and quickly give up. But when I get them to think about why they are going natural in the first place, it allows them to be strong and continue with the journey. NC: Do you have any advice for women looking to go natural? Make sure you know & understand why you want to go Natural. Be ready to LOVE your own hair texture. Prepare yourself with the right hair tools. Be conscious of the hair products you buy, READ THE INGREDIENTS! NC: What about following your passion and embracing what you love to do, which is very much what you have done. Do you have any advice for women thinking about taking the plunge? Anything they should know beforehand? AG: Whether we're talking about going natural or being an entrepreneur, both are not easy tasks to accomplish. But as my grandmother would say, "Nothing good in life comes easy. You have to work hard to get it.” Passion and purpose equals success. So live your dreams. After all, we only live once. AG: I Heart Me Summer programming, re-launch of a Portuguese (Brazilian blog), back to school natural hair event (August) and Natural Hair Meet-up in Brazil (December).